The Jazz Choir is a non-auditioned, all female group who explore well-known jazz songs from the 1930s onwards. Arrangements of jazz classics such as ‘Too Darn Hot’, ‘Stormy Weather’, and of popular music including Tamla Motown, Lennon & McCartney. New members: please enrol online before term starts by first registering here on the Addison Singers website, then purchase a Jazz Choir membership (and a rehearsal CD, if you need one), click on Checkout and choose a payment method. You will receive a confirmation email. Existing members: To access the Members section, click on Members in the top menu bar, then log in with your email address and/or reset your password. Then choose your membership and payment method. Alternatively if there are still places available, you can enrol at the first meeting of the term – but you may have to queue. After the term has started, please contact us to ask about enrolling. Any potential new member is welcome to try a 'taster session' during either the first or second rehearsal of term to see if they would like to join a choir. Please let the Membership Coordinator know if you would like to try one rehearsal for a choir, we will arrange for you to share music with a 'buddy' who will be able to show you around and answer any questions you may have. At the end of the session we hope you will decide to join and you will be asked to complete the online enrolment and pay for the full term (or pro rata if not the first session). Current choir members will also receive a £20 reduction in their fee (for the following term) if they introduce a new member who enrols in a choir for a 10-week term, i.e. this is NOT applicable for the Summer Jazz course! If a member does not take up a place or complete a term for any reason (other than the above) there is no entitlement to a refund. You can however opt to transfer your fee to the following term, but we do ask you to return the current term's music before this is confirmed. If you wish to transfer to another choir or class you need to consult our Membership Coordinator, and any difference in the fee or subscription must be paid or be refunded. Once you have enrolled in a choir or class, you will be eligible to access the Members' area on the AGS website and added to the mailing list to receive e-mail information about choir activities, social and other events. An online resource only, you can access information sheets, publicity posters, the Newsletters, Committee Minutes, photos of concerts, additional trips and social events. 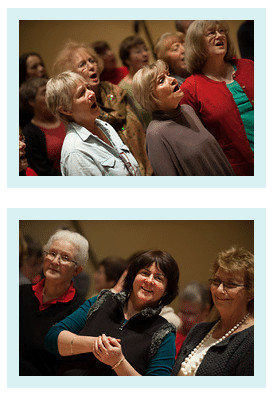 This helps us reduce postal costs and speeds up communication about choir events. The Administrator will send you an email with an invitation to join and give you a pre-selected password that you can change to a more memorable version once you are logged in.